420 | What Does 420 Mean? 420 means "Cannabis Celebration". The term is often used by cannabis smokers as a way to celebrate and encourage recreational use of the drug - particulary at a specific time (4:20pm) or on a specific date (April 20th). A group of teenagers called the Waldos went to a high school in San Rafael, California. They claim to have first used the term "420" in the fall of 1971 when they met every day after school at 4:20pm to smoke cannabis. Bob Dylan's 1966 song "Rainy Day Women #12 & 35" contains the lyric "everybody must get stoned". Also, if you multiply 12 & 35, the product is 420. People claim that 420 is the radio code used by police to describe catching anyone smoking weed. Despite the disputes of its origin, the numbers 420 are symbolic to cannabis users. There is an unofficial yearly celebration observed on April 20th (4/20). This date is also used to hold several protests & political events that are in favor of the legalization of the drug. Typically, frequent users of the drug will also use the time 4:20pm as a daily excuse to smoke cannabis. As a result of the popularity and significance of 420, mile marker and street signs bearing the number are frequently targets of theft. Interestingly, the states of Colorado & Idaho had to replace their mile marker 420 signs with the numbers 419.99 on I-70 (Colorado), and 419 & 421 on U.S. Highway 95 (Idaho) because of this issue. 420 refers to both a date and a time of the day. Stoner A: Don't you just love 420? Stoner B: Of course I do! It is my favorite day of the year! Stoner A: What are you doing for 420 this year? Stoner B: Same thing I do every day, dude. 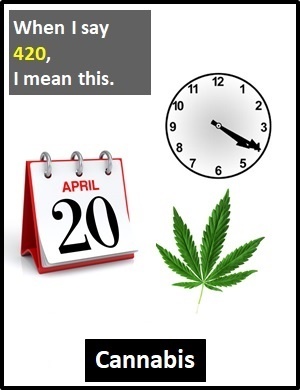 420 is defined as a cyber term because some of its characters are used as substitutes for letters (in this case, 420 replaces the date April 20th, or the time 20 past four o'clock). Most cyber terms were introduced to reduce the number of key strokes required to write the word, but since the arrival of predictive texting and keyboards on mobile devices, this efficiency is no longer required.